February blessed my region with some wonderfully mild days, but since March arrived cold winter weather has returned in full force--colder even than average, really. Since my winter wardrobe will have to hold out a little longer, I took advantage of a recent Old Navy sale to pick up a few new clothing items that are warm enough for freezing temperatures but look a little more bright and cheerful for the coming spring. As it happens, everything I got was in shades of bright yellow and blue, so I thought they'd make a pretty, color-coordinated mini haul post. Please excuse the wrinkled fabric--in true haul style, I photographed these right out of the bag! 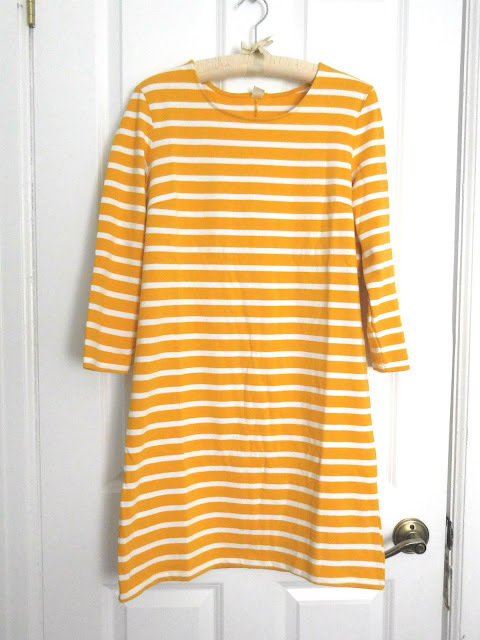 Don't let the color name fool you--this dress isn't lime green but a nice golden yellow. I guessed that this might be the case based on the online photo, and was happy to see that I was right. The material really is heavy, though, which is perfect for lingering cold weather. I think the classic shift style and sailor stripe pattern will look nice paired with navy leggings. I got mine for $22 on sale. Back in February I purchased this dress in a bright red color with a blue floral print--it's actually the dress I'm wearing in my social media profile pics. 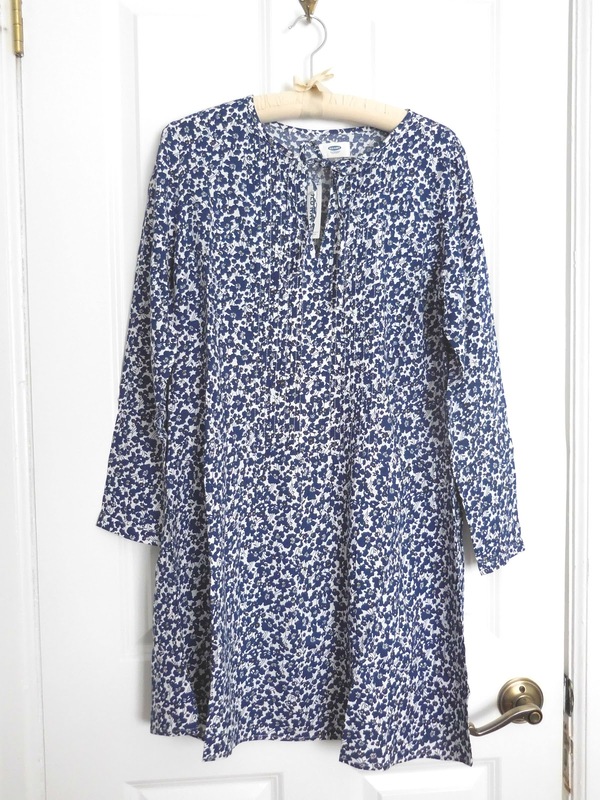 I got it for just under $12 and absolutely loved it, so when I saw they had the same dress in a blue and white floral for the same price, I had to get it again. I'm not usually a drop-waist fan but I think this cut is really flattering, and I like the ballet-length sleeves a lot. The blue flowers with yellow centers on a white background looks nice and fresh for spring, and the length is just right for wearing with leggings. 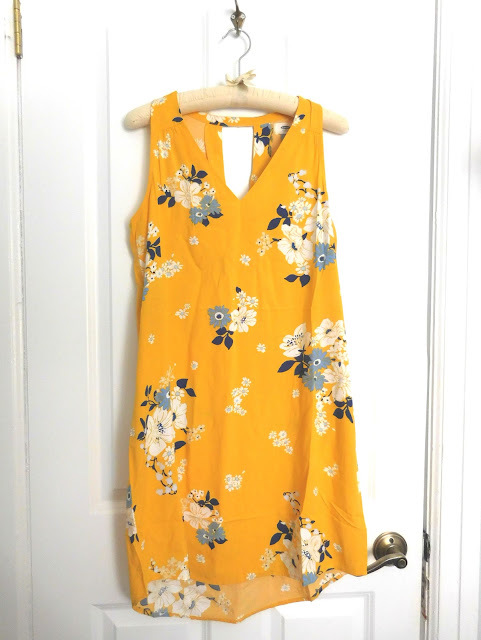 This bright yellow floral dress is so cheerful that it will brighten up even a chilly grey day. Since it's sleeveless and has a cutout in the back I'll pair it with a long, heavy cardigan for now, and switch to a lightweight cardigan later in the spring. It has a high-low hem which I think always looks great with leggings, and could transition to a summer sundress without if you don't mind a slightly higher hemline in the front. I'm thinking of wearing this with leggings for my birthday in early April, since it's almost always too cold for bare legs where I live. I got it on sale for $14.